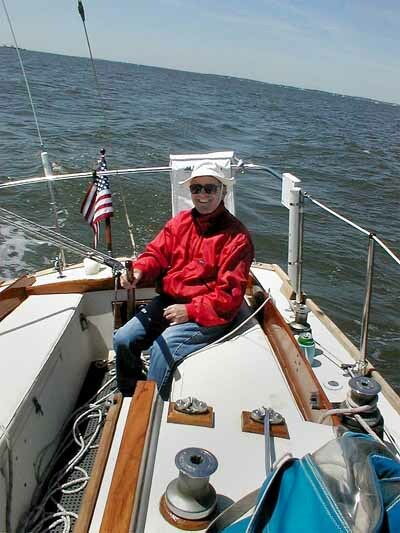 Fritz Benedict, Senior Research Scientist at the University of Texas, loves to sail. "I've got a Catalina 22 on Lake Travis," he says, "and I get to go too darn few times." When he's not sailing, he likes to spend time with his wife Ann and their dog Darcy. "Darcy is a cross between a Dalmatian and a Basset Hound," he says, "and there's been much discussion about how that could possibly occur." "I was lucky." While Fritz claims that he is "still in the process of growing up," his childhood years were spent in a variety of places. He was born in Northern California, and shortly thereafter his family moved to Saudi Arabia. For high school, he attended an American school in Beirut, Lebanon. "I was lucky," he remembers, referring to the fact that he could attend high school relatively close to his family's home in Saudi Arabia. "Lebanon was still a civilized place when I was in high school." "Something snapped in my brain." Even as a child, Fritz knew where his future career lay. As he says, "When I was eight, something snapped in my brain and I decided I wanted to be an astronomer." In fact, that conviction is what got him through college. "College was a whole lot of fun," he remembers. "In my junior year, I had to decide whether I was going to continue to have a whole lot of fun or do some work and get a degree. But there was that promise I made myself, so I chose the astronomy." "Kids playing in the sandbox" True to his personality, Fritz views the field of astronomy with good natured enthusiasm. He enjoys the process of astronomy â€“ everything from observing at the telescope to getting an answer to a scientific question. And when it comes to collaborations with other scientists, Fritz has a mental picture in mind. "I equate doing astronomy to kids playing in the sandbox. You have certain kids that you like to play with and other kids that you don't. If you can find the kids you like to play with in the sandbox, it's golden. There's nothing you can't do."